All this digging into 7-Eleven’s graphic identity (BTTF II & Lucky Dragon) has made me want to do my own version of a futuristic 7-Eleven logo. I tweaked the 7 in numerous subtle ways, adding a hint of italics. I then tweaked the text to match. Because I like what Burger King did with their logo recently, I thought I’d try to do the same thing here: take something previously rectangular, and shape it into a circle. The resulting shape can also suggest a crescent moon, implying their late-night hours. An unofficial logo redesign experiment. As an aside, this is the third time I’ve tweaked this art. Not counting my first raster attempt in 2000. Barring the invention of an actual time machine and a trip back to the set in 1989, or the discovery of some long-lost photos, I think this is as close as we’ll get. 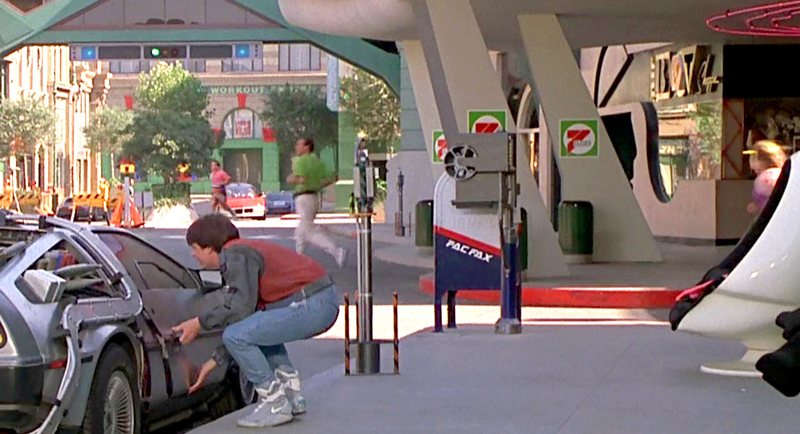 We may bemoan the lack of flying cars, and hoverboards but at least gas isn’t $7.25 a gallon. Never noticed it today, but the ‘car’ has a 2015 California tag just like the DeLorean. 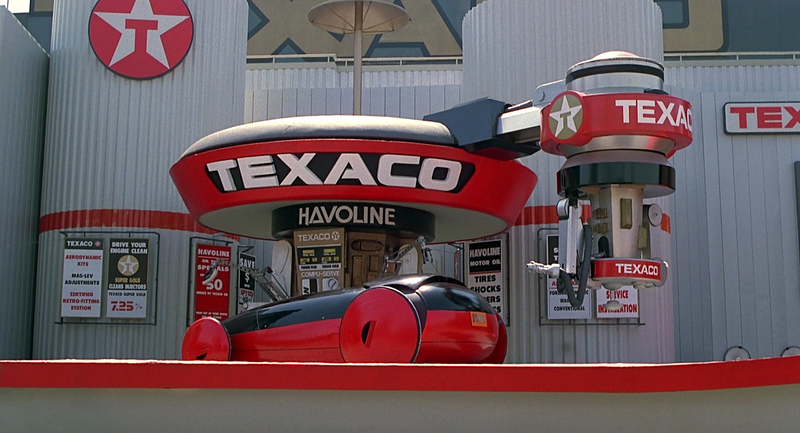 Incidentally, there was a not-really-but-suspiciously-similar-to-MicroMachines-scale ‘playset’ of the Texaco station, and a couple sets of different cars put out for BTTF II. 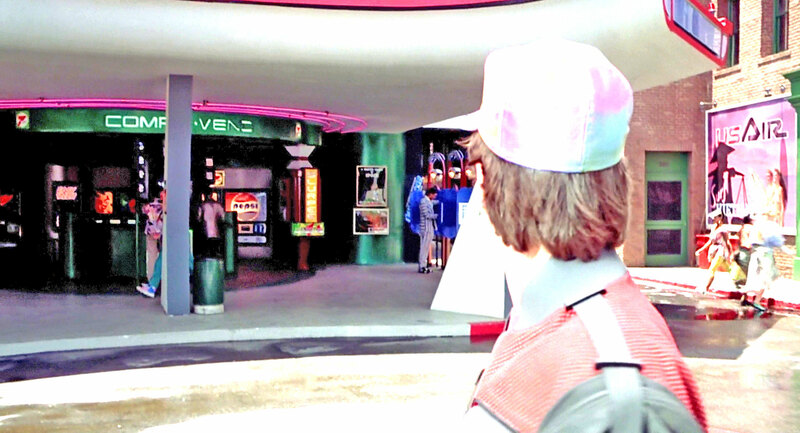 DeLoreans, Hill Valley police cars, the Taxi. Don’t recall seeing this car in the sets, though. But what’s on the first floor, below the Texaco station? A 7-Eleven, of course! Not even joking. It appears to be entirely vending machines, selling Slurpees, Big Gulps, beer and Kodak film.